In order to secure an event on the approved master calendar, this form must be used. The form is used for events held in a church. 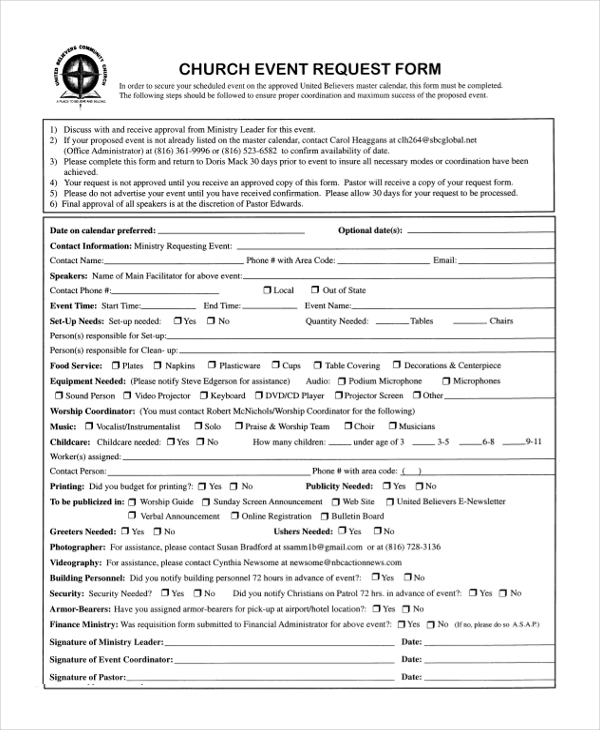 A copy of this form is given to the pastor so that there is a proof of paperwork done. Information is required for an approval like the event date/time, area, contact information , speakers, food and equipment needed, music, childcare, photographer, videographer and much more. Signature of the pastor, ministry leader, and event coordinator is required along with the expense authorization form. 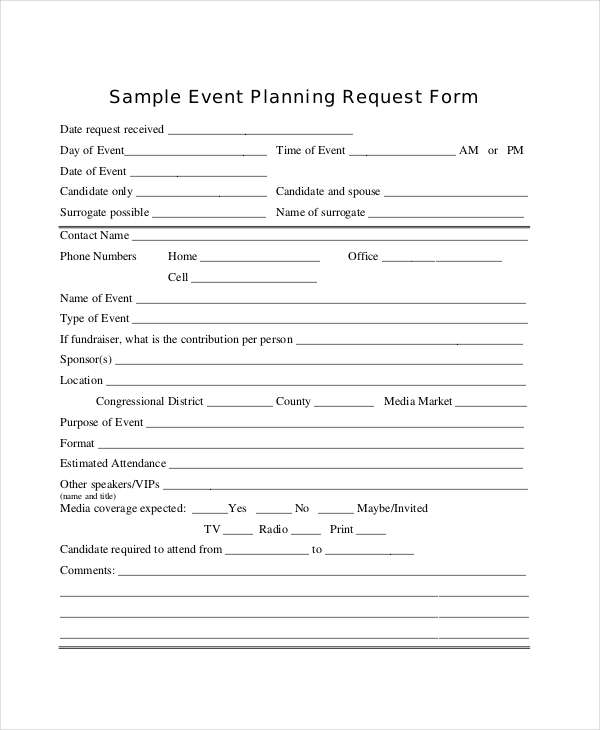 To plan an event in an organized way, this form may be used. Basic and relevant details like event date, time, type of event, the purpose of the event, location, estimated attendees and other required information is needed. Only after the submission of the forms and approval, the publishing or advertising agencies are requested to start their work. 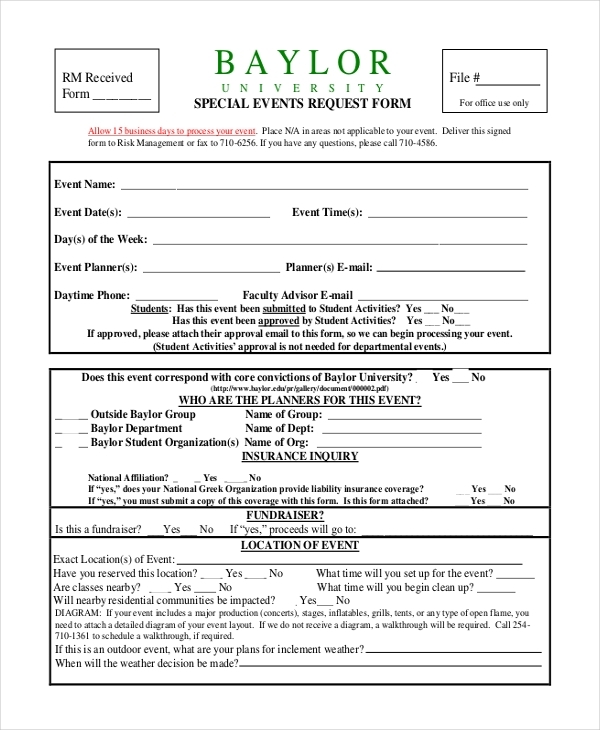 To book a special event, this form must be used. The event is processed within 15 days. The form needs to be delivered to the Risk management department along with the required details. The event management staff will look into it as soon as you submit the form. 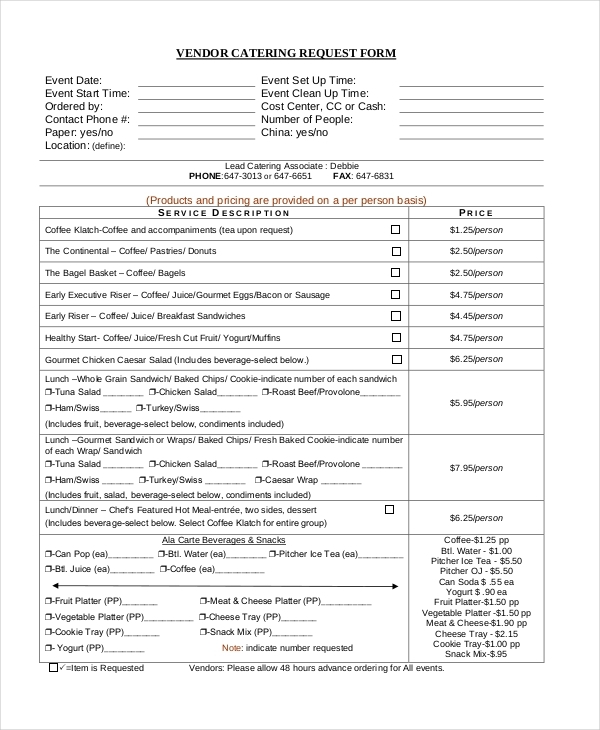 For a nutritional service in the hospital, catering event request form can be used. This form has product description section where the food items are mentioned in particular. The special event request form is booked with the details like time, date, location and meal ordered. A special comments section is provided if the client needs to add something else. Corporate events are really important ones. The information filled in this form is vital for booking an event from beforehand. The event can be educational, fund-raising, trade show, seminar or workshop. All the related fields are required, without which the event booking would be impossible or delayed. To make sure that all the resources are available and allocated properly for providing space for an event, this form can be used. The reply to the form will take place within a week. The form will help the community event provider to ponder upon the request. The mission of the event is asked along with other fields like the age of participants, event time, address, date etc. 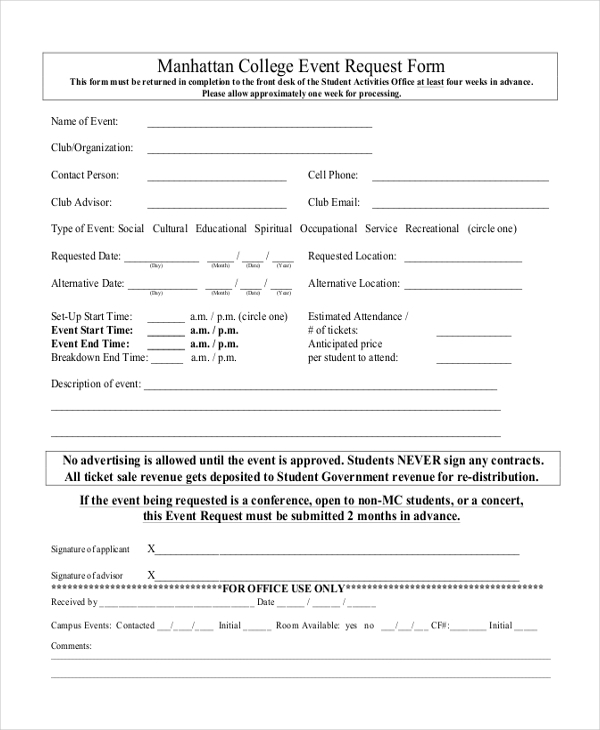 For the organization of a college event, a college event request form must be filled. The forms are filled up in due time and submitted to the student activity office. The person has to fill all the details so that an approval reply comes as soon as possible. Advertisement of the event before the approval of the event may lead to cancellation or delay of it. For approving a company event, this form is appropriate. 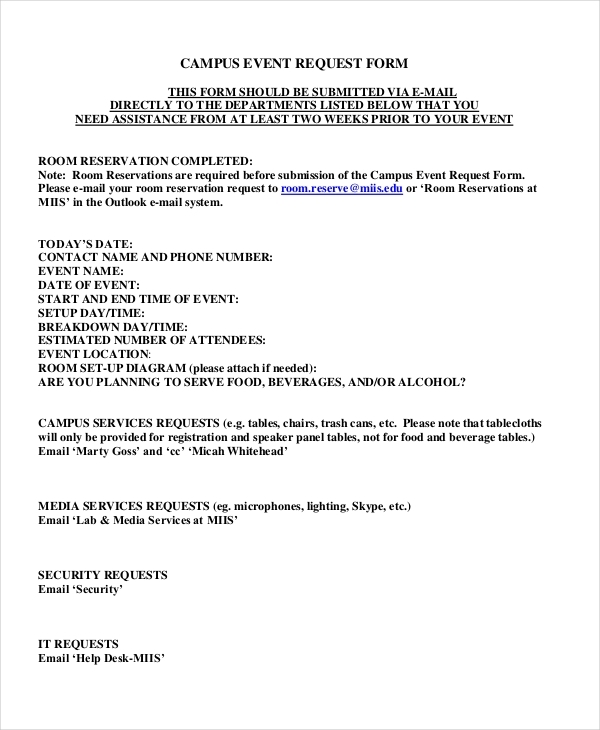 The form mainly asks about the event type, and the supplies needed for the event like Wi-Fi connection, chairs, food, photocopies, projectors etc. An approval is required to host an event on the campus. For this purpose, a campus event form is required. From the date of the event, the number of people attending, campus service request to IT requests, security request, and all the details are needed. It is only after a proper evaluation that the forms are either rejected or accepted for the event. 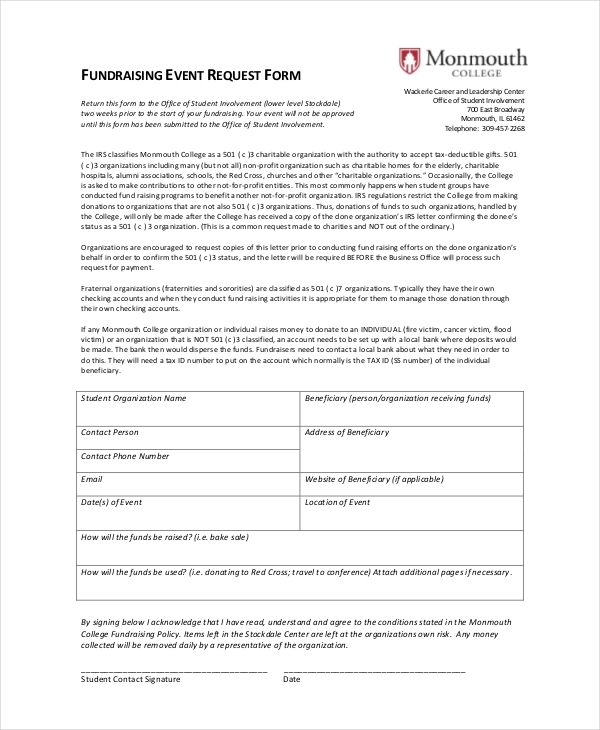 To organize a fund-raising event, a fund-raising event request form is required so that the authorities accept it as soon as possible. The forms must be submitted 2 weeks before the event date. The forms will not be approved until it is submitted to the Office of student involvement. 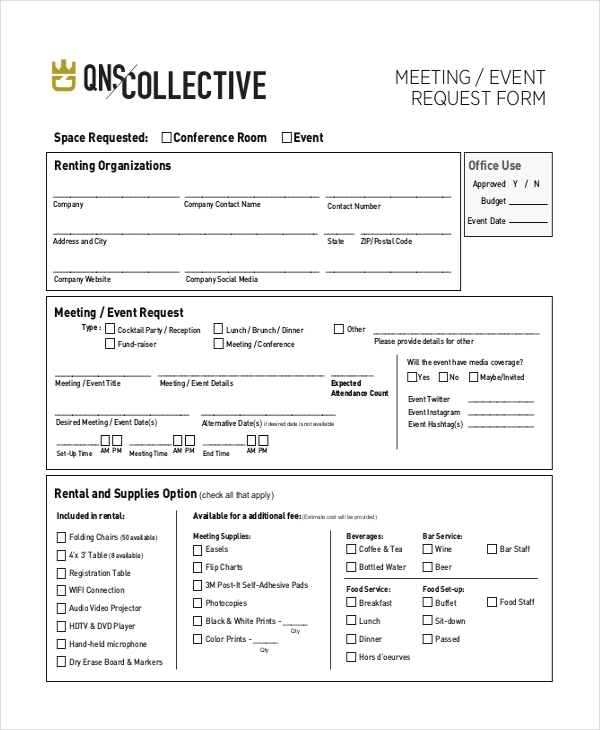 For an exhibitor hotel meeting space request meeting, this form will be highly useful. 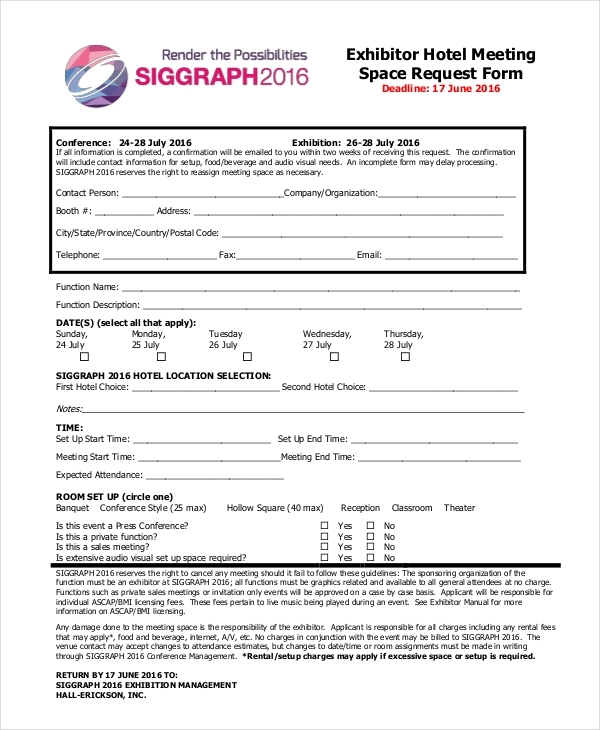 Details about the time, room setup, location selection is asked in this form. The form informs about some of the rules in case something goes wrong. 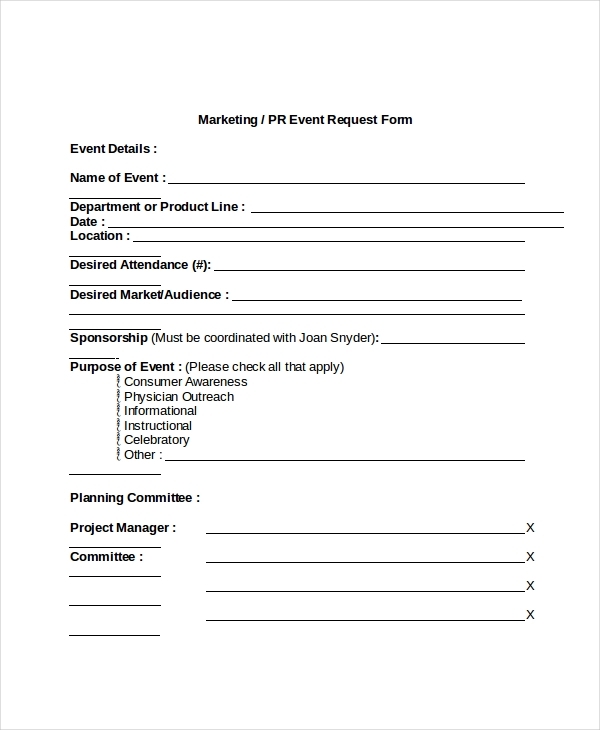 For booking an event related to marketing or public relations, this form can be used. Information regarding pre-event publicity, project manager, committee etc. are asked. The form is filled up with the basic details like the date and location of the event. The purpose of the event is written in the form out of which the person has to select one. The form should be approved before one starts advertising about the event. This form is a digital one. 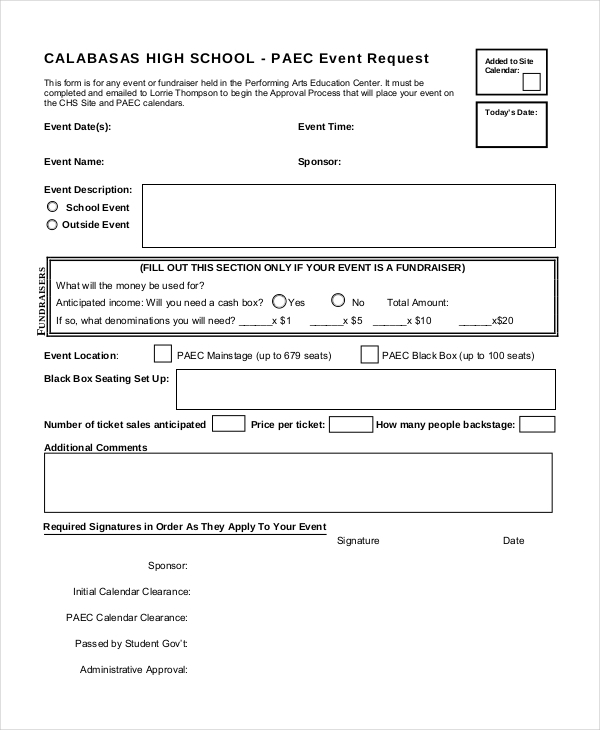 To book an event in the performing art education center this form is to be used. Lots of fields are required to be filled so that a fair idea is given for the arrangement of the event. 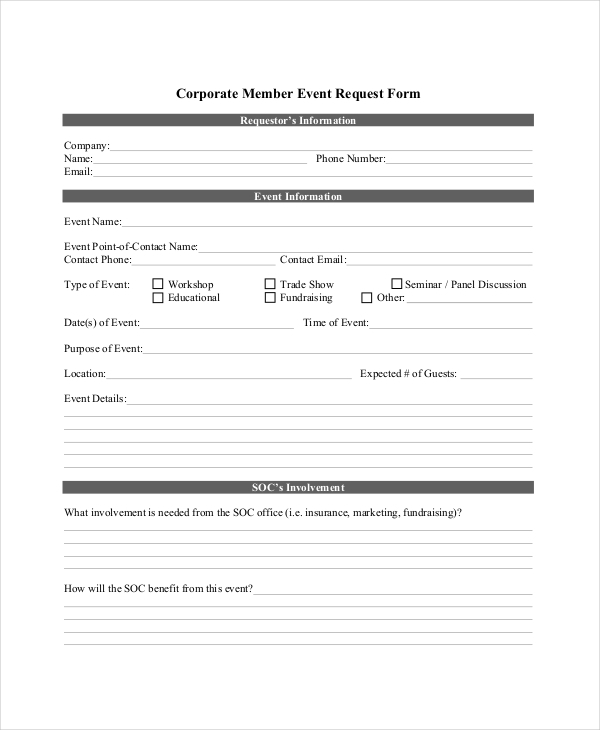 This form is a proof of asking permission to hold an event in the center. Rejection can take place if the arrangements cannot be provided or dates clash or for any other reason. This form must be submitted forty-five days before the date of the event. All the questions have to be answered. There are several questions related to the event such as the contact, location, co-sponsor name, food and alcohol serving, static displays, age group, event description and much more. 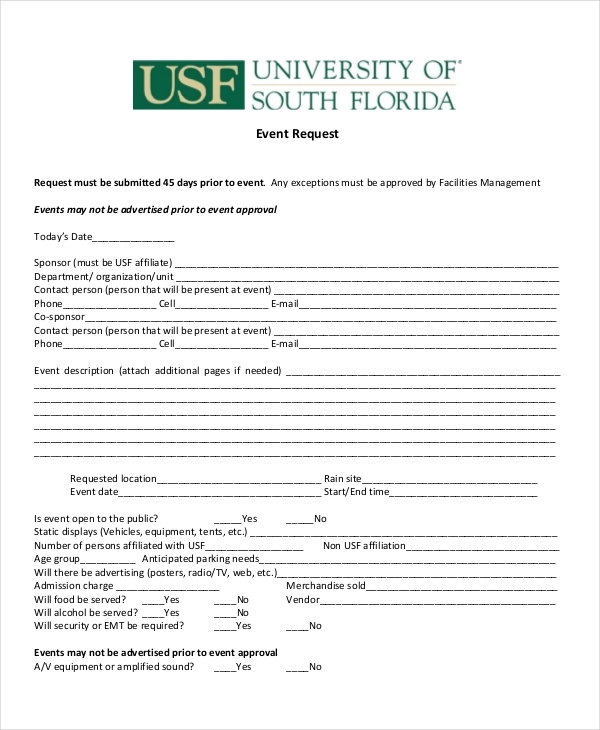 Why Would You Use an Event Request Form? It is always better to book a slot for an event from beforehand so that your plans do not get delayed. The forms are used as a permission paper as well. After an approval of this form, further processes will take place. The forms are useful as a formality and legal procedure. You are booking an event either for a charity show, educational purposes, corporate meetings, meal services and much more. It is important that these forms are used so that there is a proof of signing up for an event. Information is given beforehand leading to acting on it as soon as possible. It works as a proof that the paper was submitted for booking an event. Event requests take at least 15 days to be approved in some cases. It must be known that all the fields in the forms should be filled. Any incorrect information filled in the form may lead to punishment or delay in the event. Before filling such forms, you must plan everything out in a clear way. Without this, you will be unable to fill several fields like the number of guests coming, food needed, equipment requirement etc. The forms take time to be approved; until then, some places request not to advertise their event. 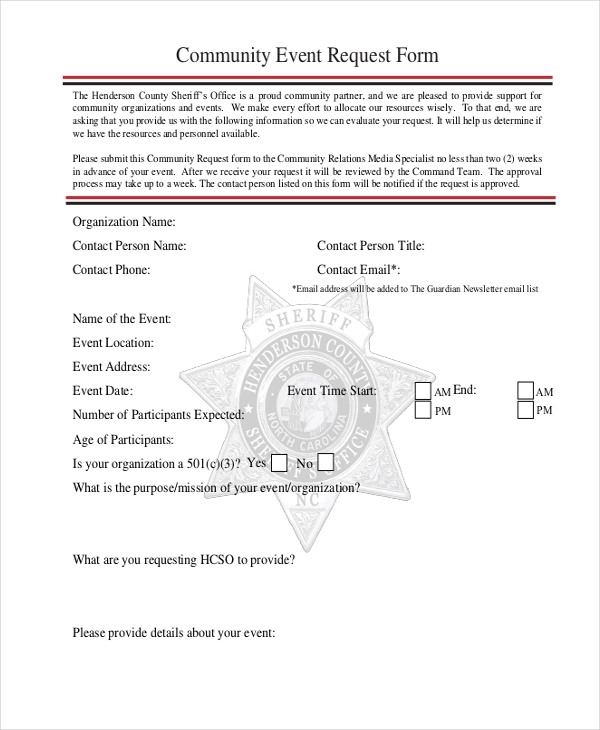 Having these forms will give a surety that permission for event setup was asked. These forms are important to show the higher authority that permission was taken and that the event has not been setup without it. The forms can also be used in court as a proof if anything goes wrong with respect to the event. Download these forms in just a few minutes so that your work becomes easier and quicker. The forms are available on our website for free.